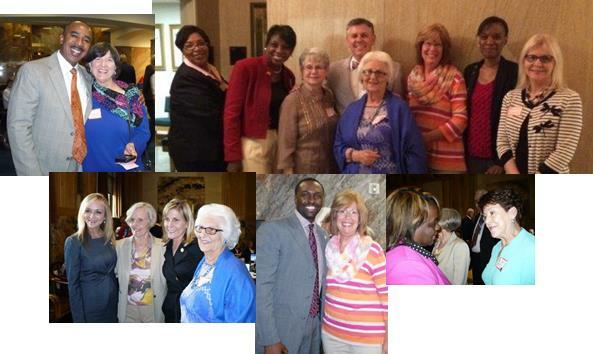 May 13, 2015 — Best Encourage-A-Legislator Appreciation Day yet! 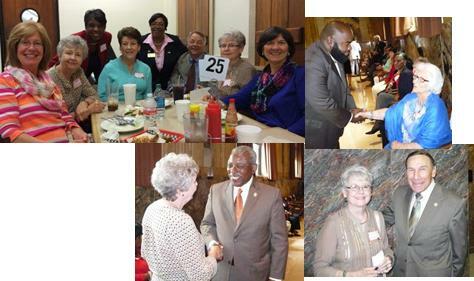 Thirteen CWA members and prayer volunteers from several towns across the state met in Baton Rouge at the State Capitol for our annual Encourage-A-Legislator (EAL) Appreciation Day. Our new State Director, Sancha Smith, and the new members of our Executive Board were able to join us. We dropped off one hundred and forty-four pralines as a gift of appreciation to the Senate and House of Representatives. In the morning, the prayer volunteers were busy meeting their representatives as the representatives stepped out of their committees to greet us. The highlight of our visit was getting together in the Capitol Chapel and praying for each representative and senator by name. Again this year, Rep. Nancy Landry introduced us in the House Chamber where we received a warm reception. Many of the representatives came over to shake our hands. One representative invited us out to the hall lobby to get our picture taken with her. One representative said, “I was wondering who was sending us these postcards.” He gave his prayer volunteer a hug when he met her. Another representative said he takes his postcards home at the end of the week. It was an exciting day. We enjoyed being together and meeting our representatives and thanking them for their service to our great state. We are thankful for the thirty-six wonderful prayer volunteers who prayed for these legislators during the Legislative Session. Most of whom were not able to take the day off to come to the State Capitol, but their dedication to prayer is what makes this ministry a success.